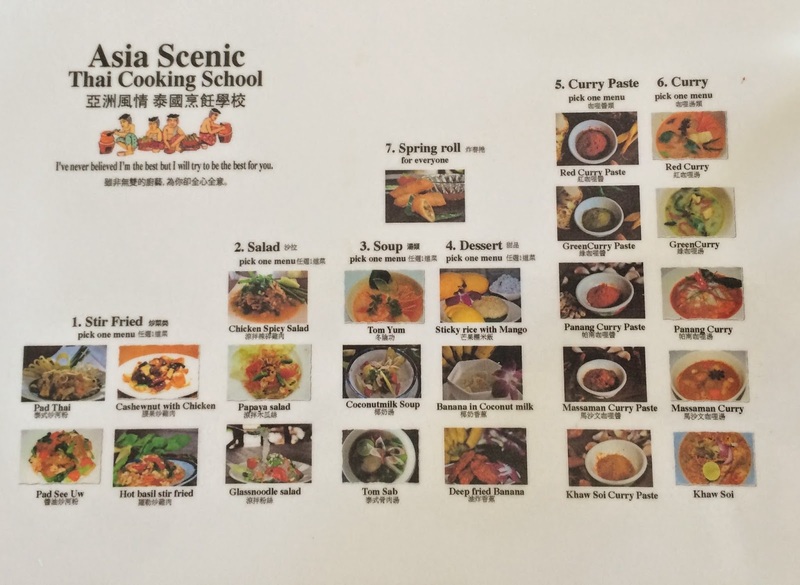 On Saturday I attended an all-day Thai cooking class at the Asia Scenic school. 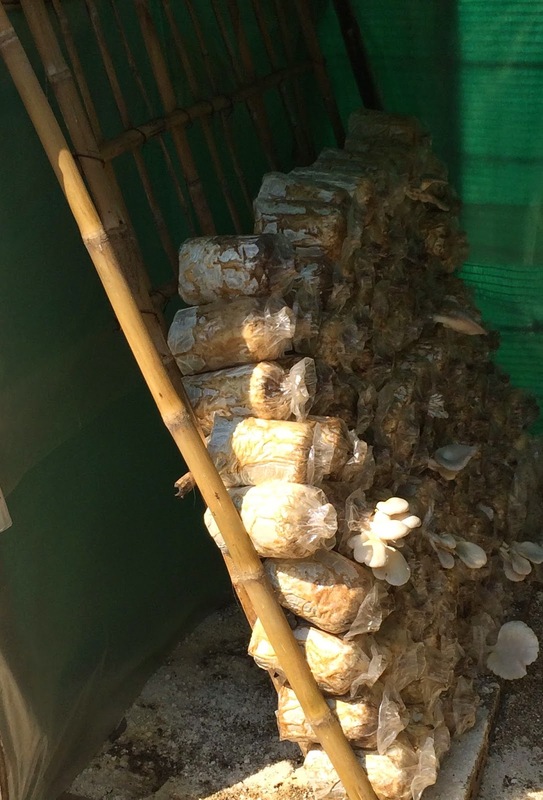 It was held at an organic farm about 20 km outside of Chiang Mai. 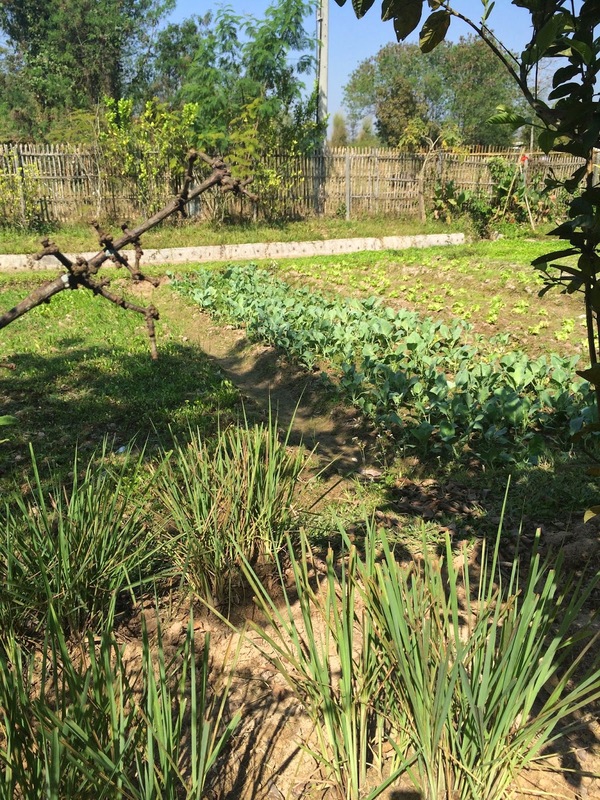 Everything used in the cooking classes is grown on the farm. 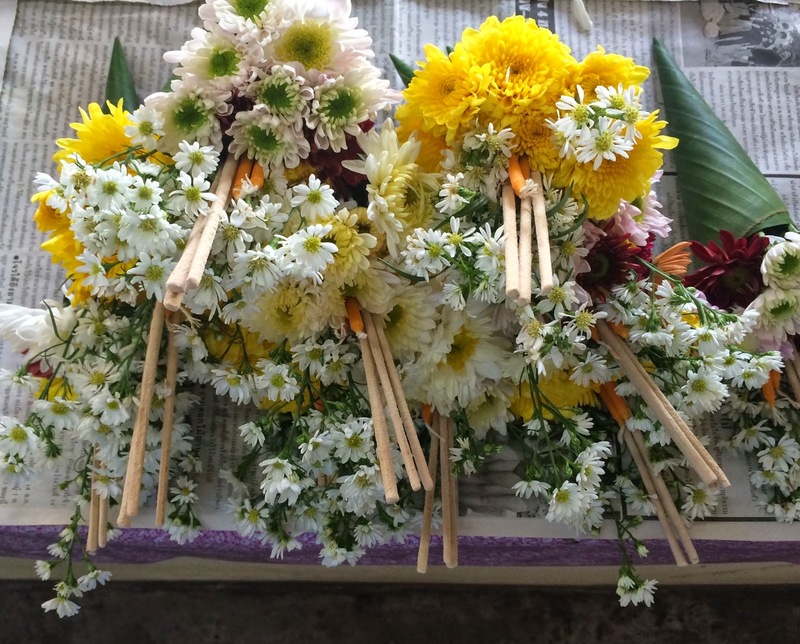 There were eight of us in the class, three from Belgium, three from China (parents and 12-year-old daughter), one from the Philippines and me. 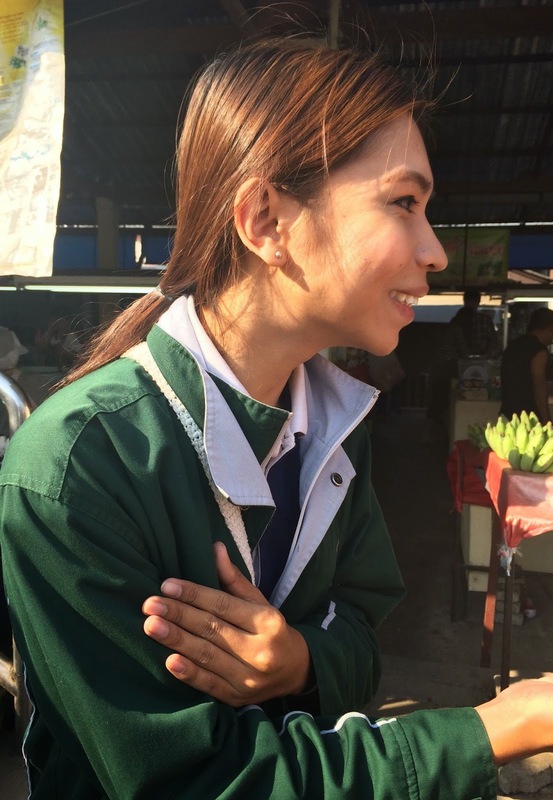 The Filipina woman was with a US man who was an observer (and taster). Our teacher was Em. 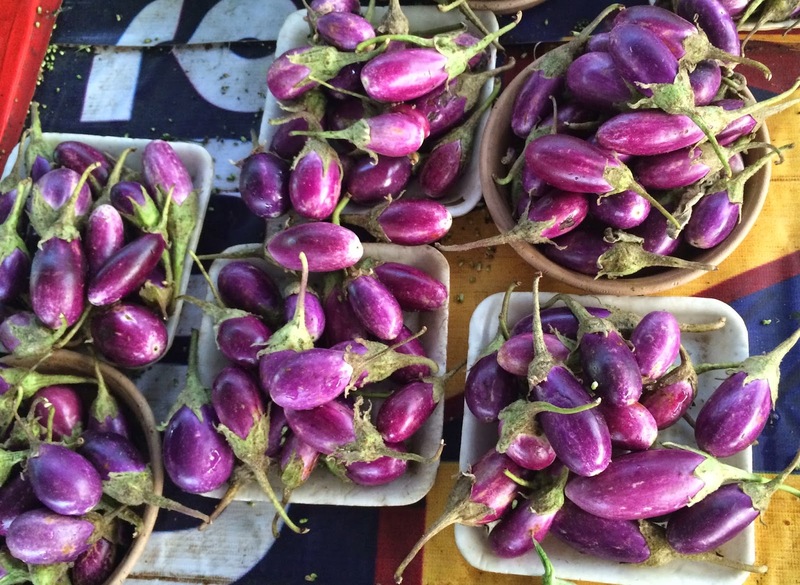 Our first stop was at a local market where we learned more about the things we've been seeing. 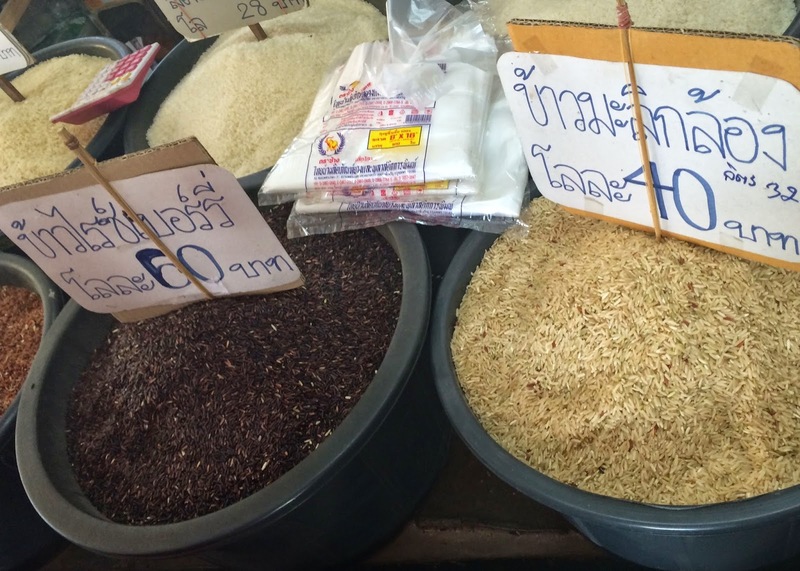 There are many varieties of rice, including red and purple and several kinds of sticky rice. 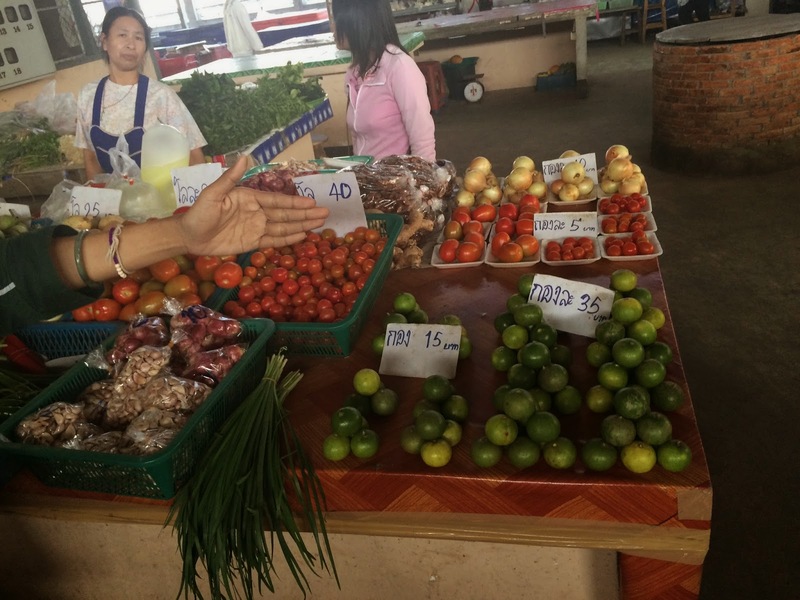 Prices shown are baht per kilo; 40 baht would be about $1.30. 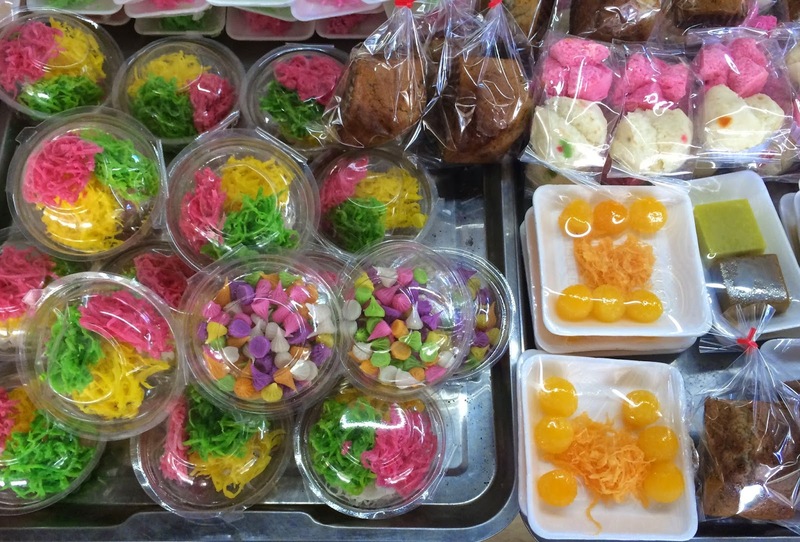 Some kinds of sweets -- very colorful! The placemat also served as a menu showing the options we had. We would all choose one from each category. 1--Stir Fried: Pad Thai, Cashewnut with Chicken, Pad See Uw, Hot Basil Stir Fried; 2--Salad: Chicken Spicy Salad (Laab), Papaya Salad, Glassnoodle Salad; 3--Soup: Tom Yum, Coconutmilk, Tom Sab; 4--Dessert: Sticky Rice with Mango, Banana in Coconut Milk, Deep Fried Banana; 5--Curry Paste: Red, Green, Panang, Massaman, Khaw Soi; 6--Curry: same names as pastes; 7--Spring Roll. 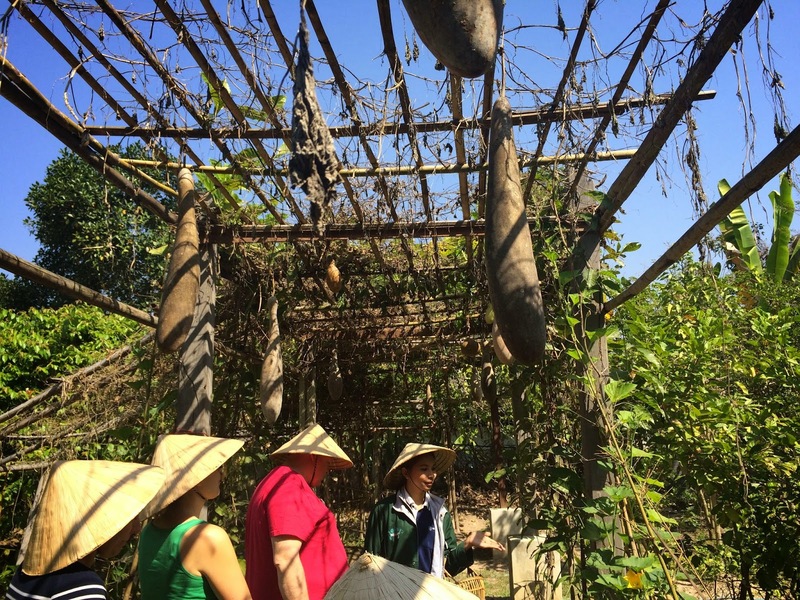 Before starting the cooking lesson, we took a tour of the extensive grounds. The first food item was a welcome snack as you might receive in a home. 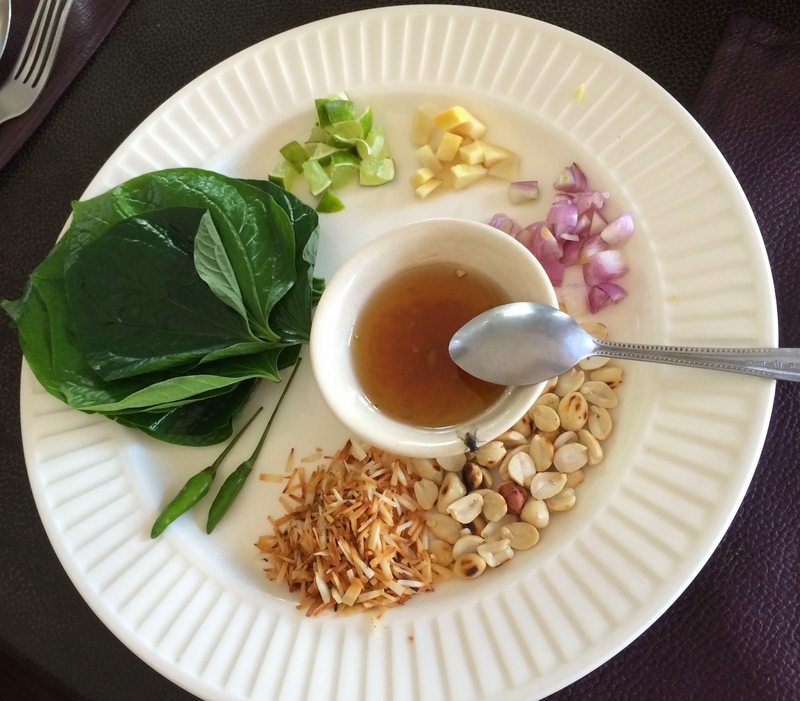 A betel leaf is folded into a cup and chopped lime, garlic, onion, peanuts and roasted coconut are put in. A small spoon of sweet sauce is added and the whole thing is popped into the mouth. It was quite tasty! I liked it better than Indian paan, which is similar. 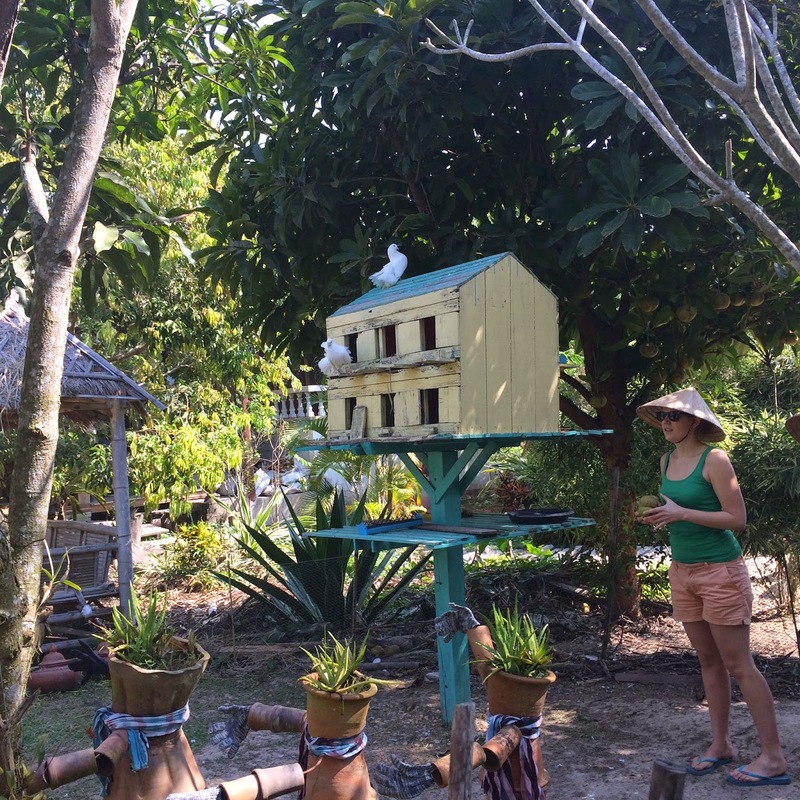 We were shown how sticky rice is made. 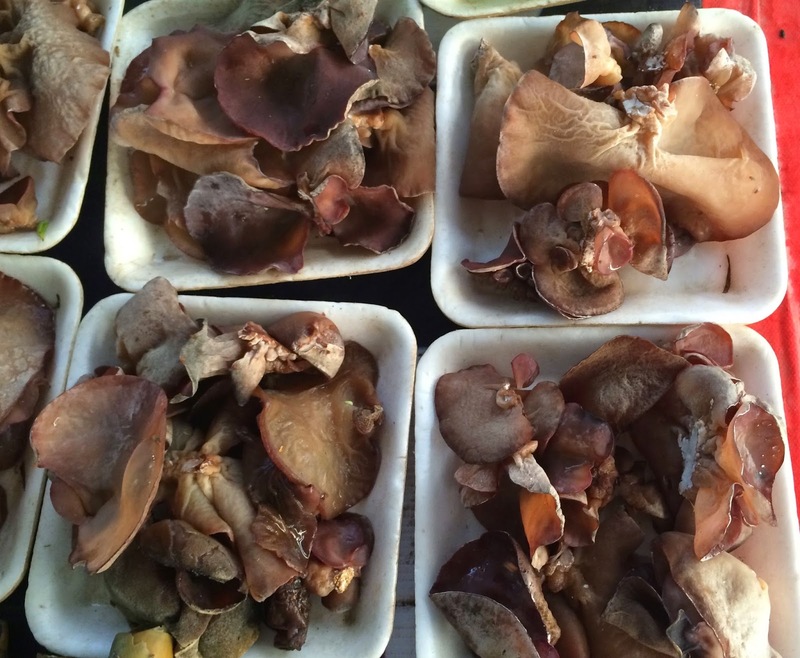 It is soaked for at least six hours, then steamed in a bamboo basket over simmering water for 30-60 minutes depending on its age. The helpers cooked it for us. Our first dish was the stir fry. I chose Pad Thai, which I'll be most likely to make when I get home. 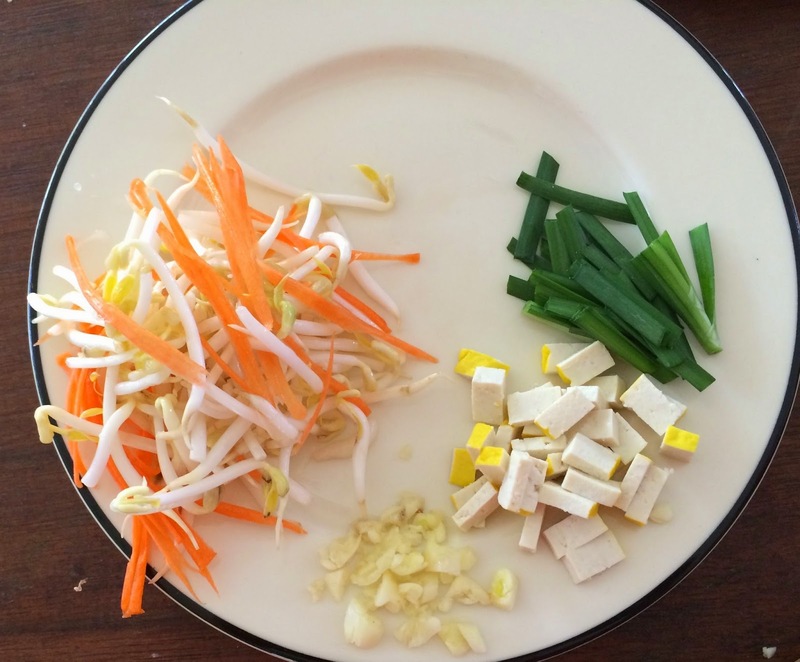 We chopped the chives into one-inch lengths, tofu into small pieces, and garlic. 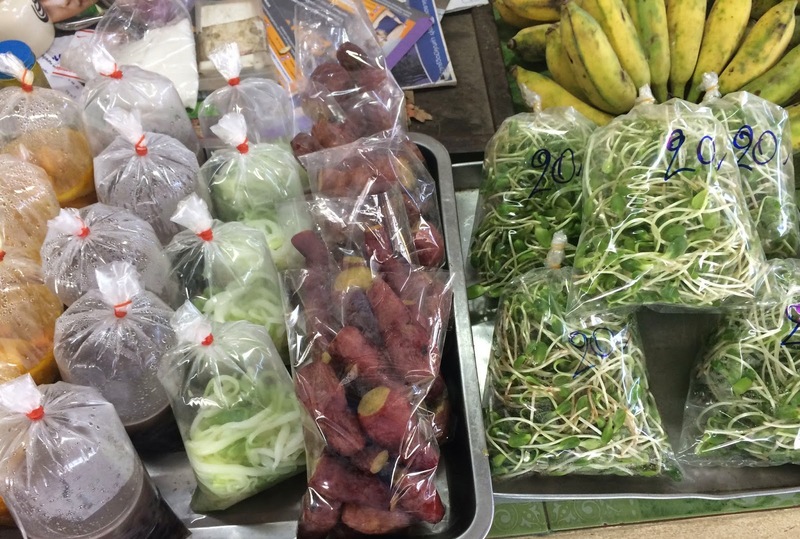 The carrots were already shredded and given to us mixed with bean sprouts. We each had our own wok on a gas burner and cooked the stir-fry dish of our choice. 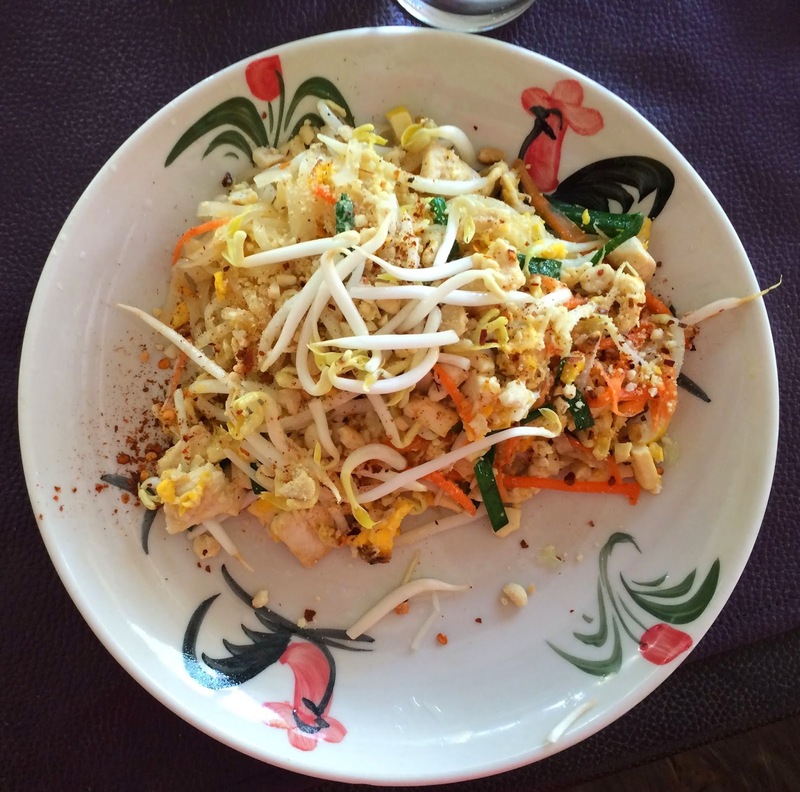 Below is my plate of Pad Thai. Each recipe was just right for one person. It was nearly noon by this time, so we were happy to eat. 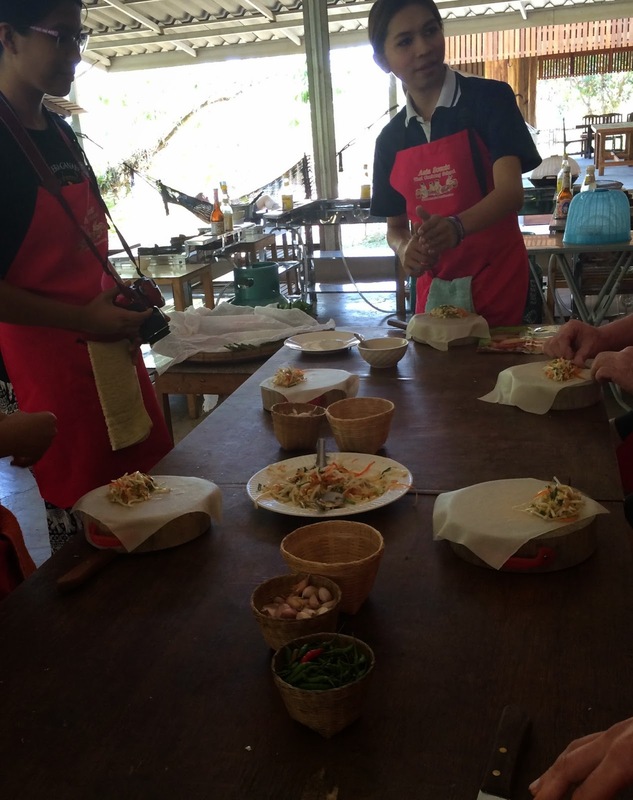 Below is the work table with Em showing us how to wrap our spring rolls. One person stir-fried the ingredients and let them cool. The wrappers are laid out on our round wooden cutting boards. We each had a large sharp cleaver to use, too. Ta-da! 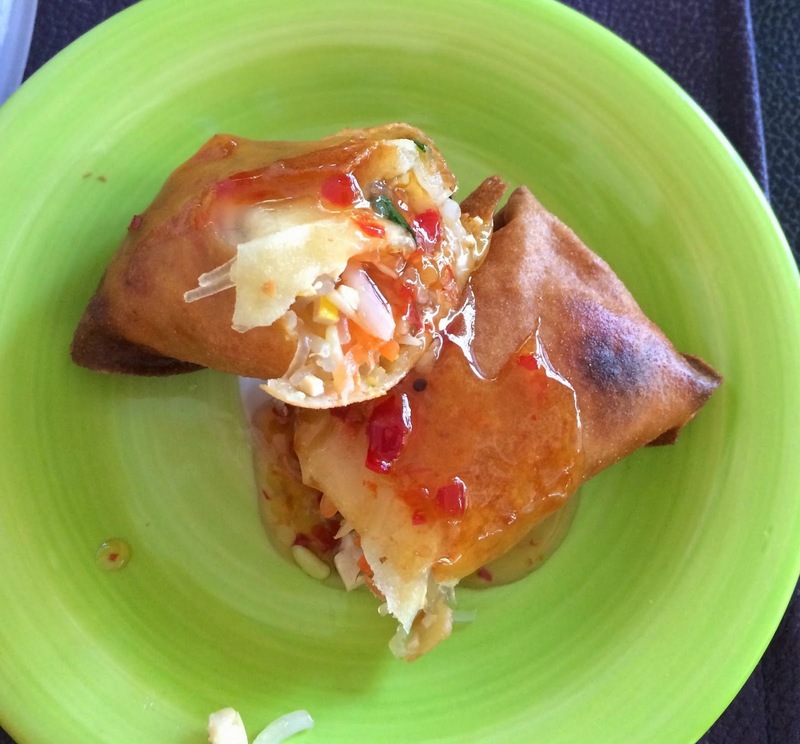 My first handmade spring roll. The next item was our salad. I chose Glass Noodle Salad. 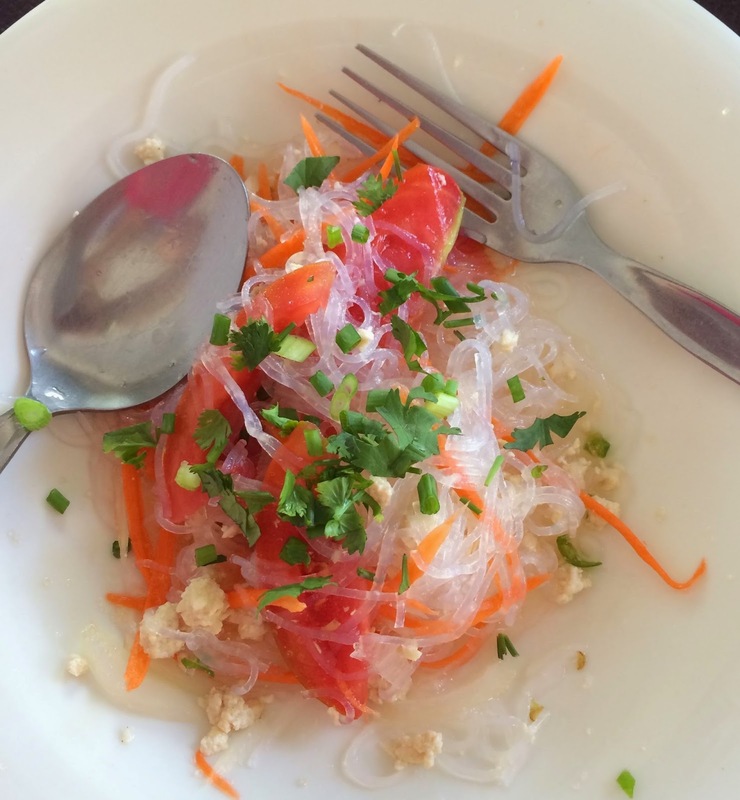 The glass noodles are made from mung beans (I learned a lot of new things!). The noodles are cooked ahead and then everything is mixed together. 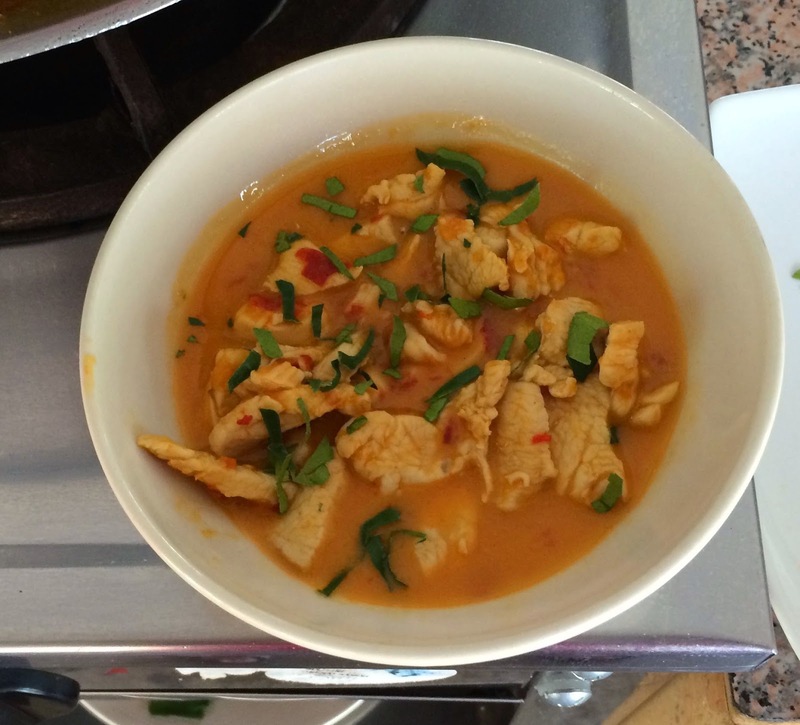 Below is the prep plate for the Tom Yum Soup. 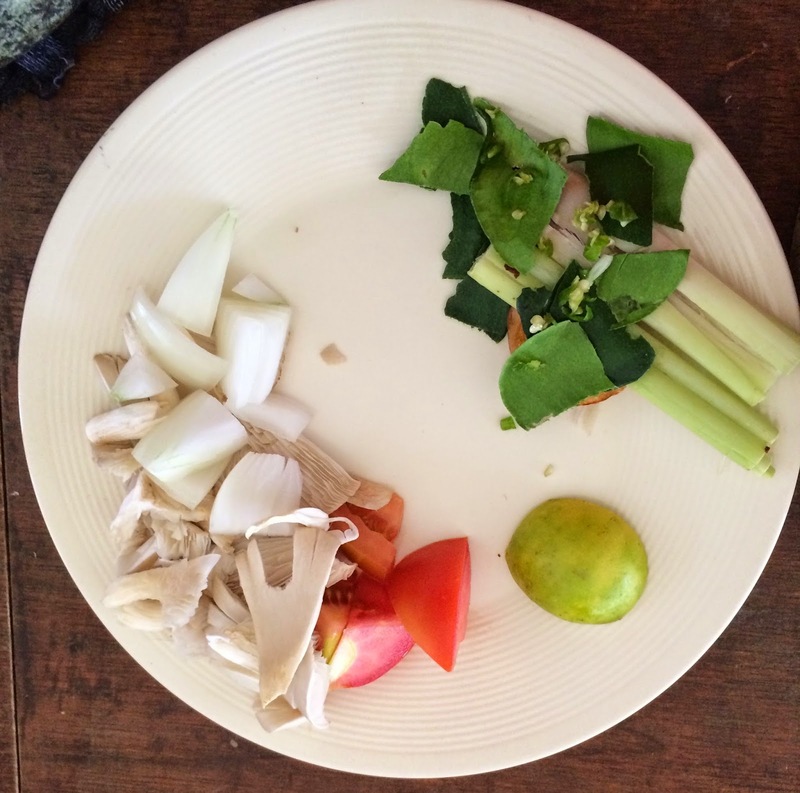 The lemongrass, kafr lime leaves and Thai ginger are torn or smashed to extract the flavor but these ingredients are not eaten. 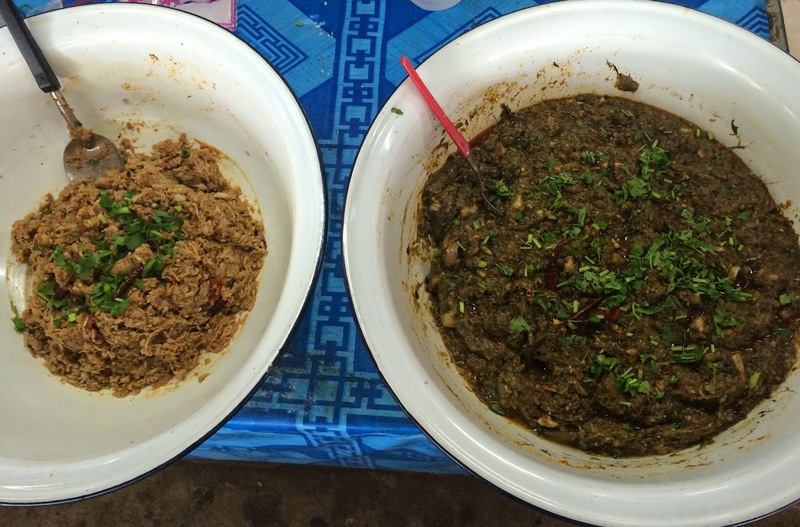 Mushroom, onion and tomato are cooked and the lime is used at the end. This was my least favorite dish. 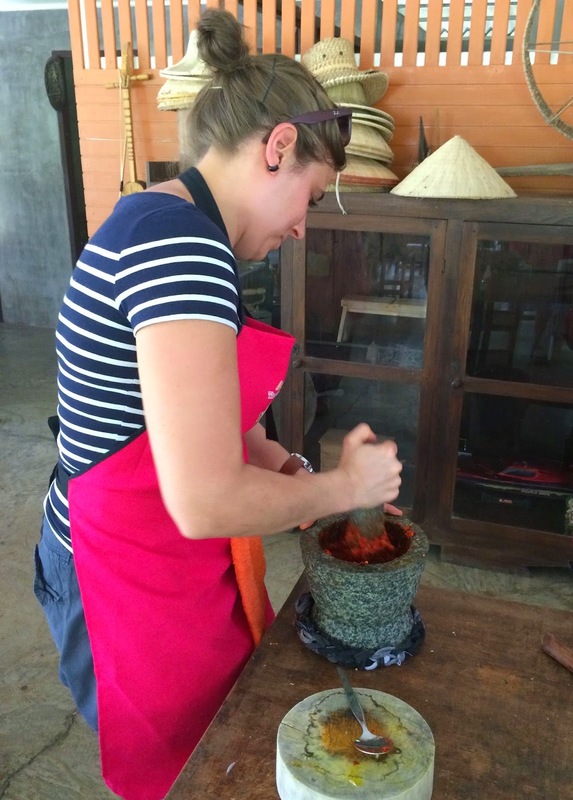 We had to make our curry pastes from scratch using a large mortar and pestle. 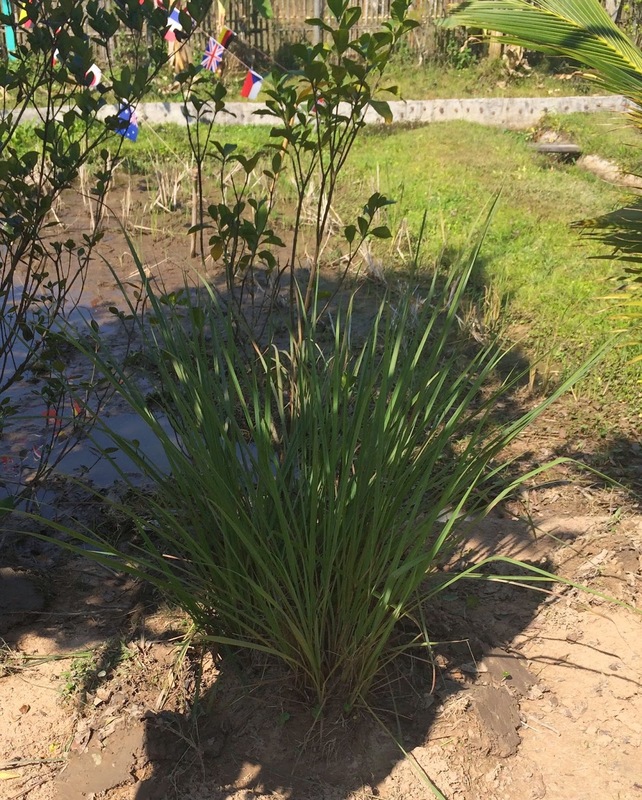 Red, green and massaman were in different mortars. It took a long time to get the paste pulverized enough to suit Em. 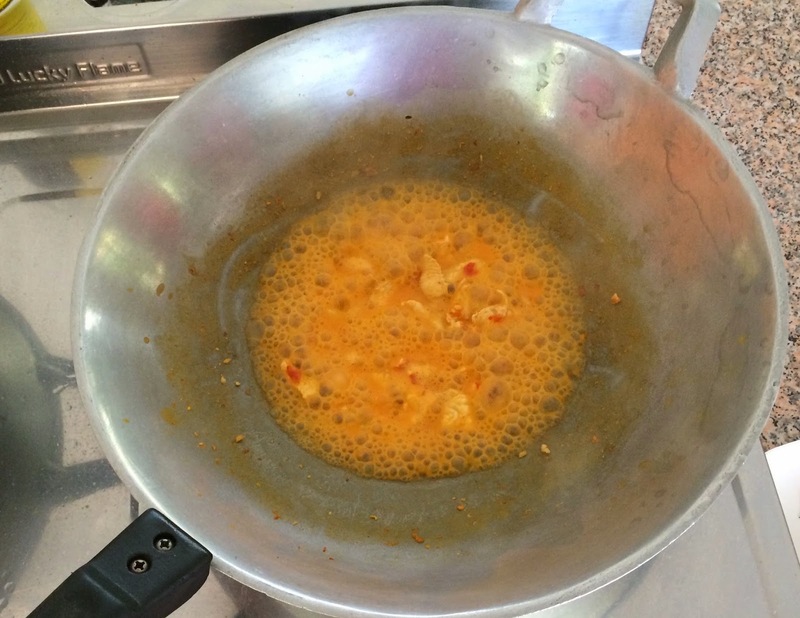 The red curry paste was separated for Khao Soi (curry powder mixed in) and Panang Curry (peanuts mixed in). My Panang Curry beginning to cook. My panang curry turned out wonderfully. 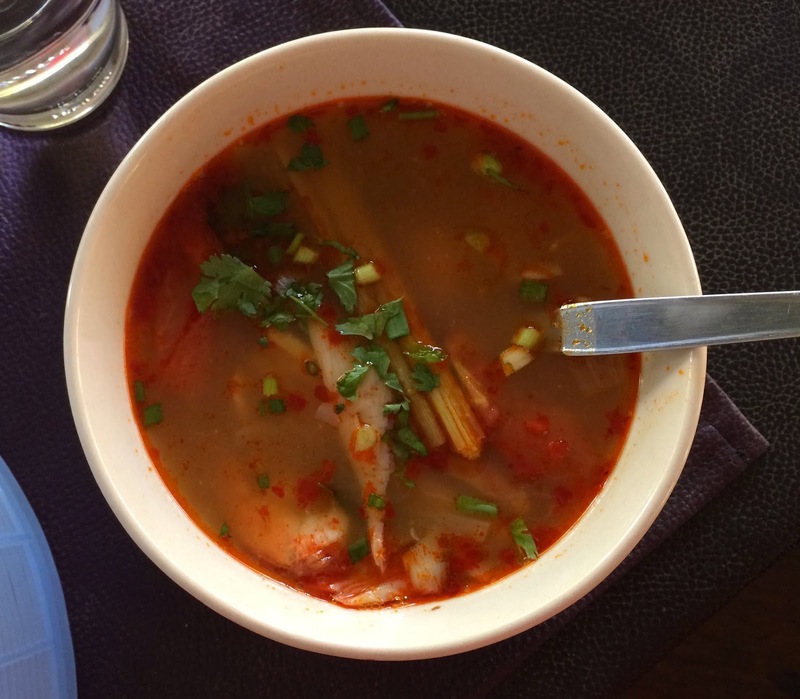 Coconut milk is the liquid base, as it is for many dishes. 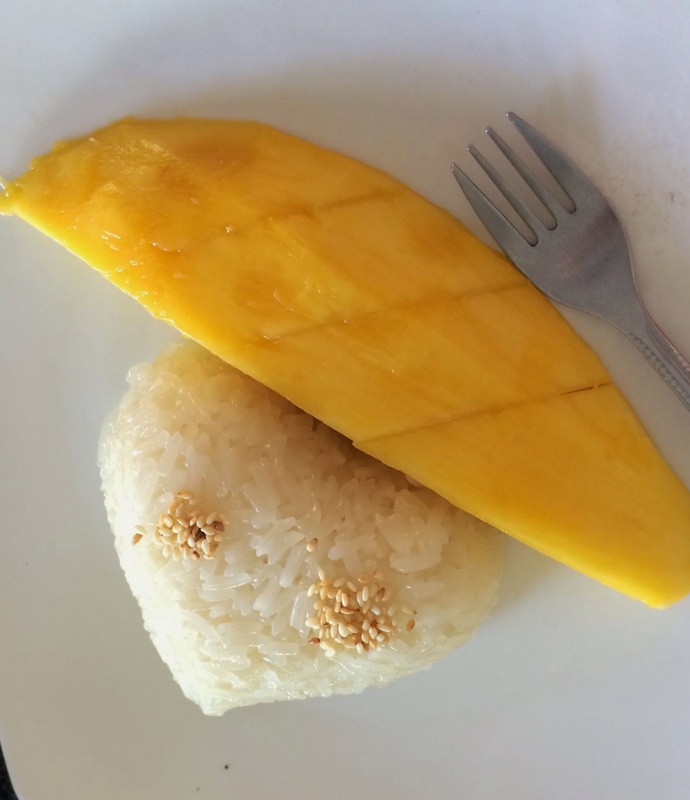 For dessert, I chose Mango with Sticky Rice. 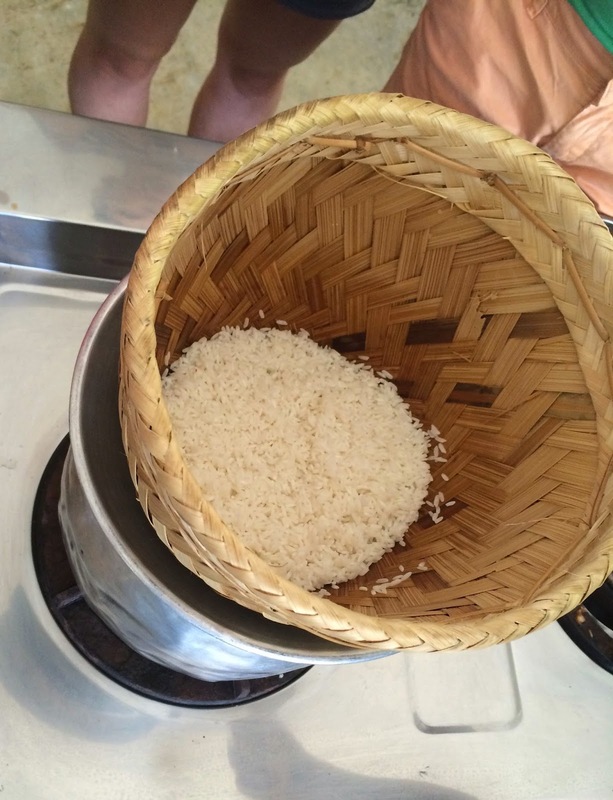 One of the class members cooked the pre-cooked sticky rice with coconut milk and palm sugar until it was a sticky mass. The helpers plated it and prepped the mango. What a day! I was thoroughly stuffed by the end and didn't want anything else in the evening. I got back to the hotel about 5:00. I am hoping to use some of these recipes once we are home. 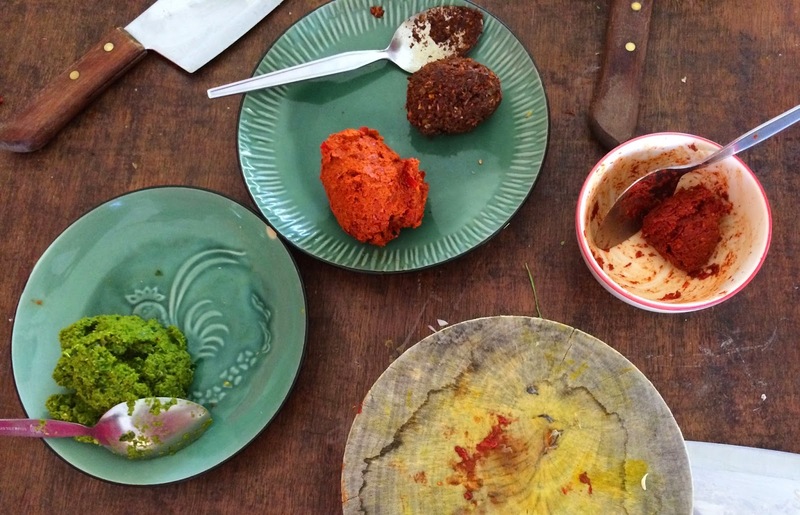 I probably will not make curry paste in a mortar and pestle, though. It took a good 15-20 minutes of pounding.